Our very own social media maven, Lauren, shared her daughter Harper’s nursery this past fall and our readers have fallen for it fast and furiously. We get so many questions on where everything in this space came from, we thought it would be easier to create a post that sources all the most fabulous items in the room in the easiest way possible. 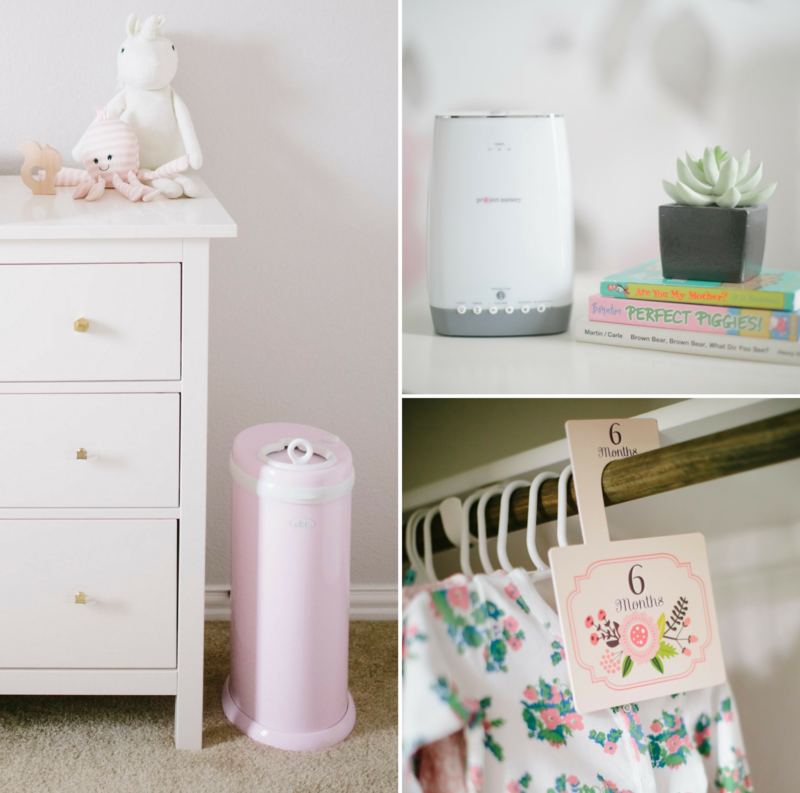 You can see more pictures from Harper’s nursery in Lauren’s original reveal. Don’t forget to post your own nursery to our gallery! We love to see nurseries inspired by other nurseries. Would love to know where she got the drawer pulls! She got them from Hobby Lobby. I was curious if you remember what paint you used to paint the aluminum ends on the shelves above the chair? Hi Mandie, Lauren used Rustoleum Metallic Gold spray paint. Happy DIYing! Hi , Where did she get the curtain rods ? Hi Isabel, Here’s a link to the curtain rod. This nursery room has been my inspiration! We purchased the gorgeous wallpaper, crib, RH drapes and the hardware, already had the IKEA dresser from our oldest daughters room, and the side table, bookshelves, and wall shelves from target. :) But now I’m curious, where did she find the gold basket to hold swaddles? Can’t seem to find one similar. THAnks! Hi Melissa, It’s actually an old magazine holder that Lauren spray painted gold. It’s not a recent purchase, but maybe that info will help in searching out something similar. Can’t wait to see your space! Hi Beth, where did you get the handles for your Ikea dresser? Also, did you paint the inside of the drawers? They appear to look warmer than on the original sold by Ikea. Hi Caroline, I think Lauren got the handles at a local craft store (no link). I do not believe she painted the insides. Her dresser is the white color, which is creamier than the white stain option from Ikea. Lauren has the white dresser from IKEA. She says it’s not an exact match (the dresser is a little creamier than the crib) but with them on opposite sides of the room, she really doesn’t notice. I can tell you that I have the same dresser in white stain and it is more of a true white, but the finish is not glossy like the white. Good luck with your nursery! We hope you’ll add it to our gallery. We love seeing nurseries that were inspired by other nurseries! Does anyone know what color the ottoman was purchased in? Thank you! What color did she purchase the glider in? It’s this glider in Bull Natural. Do you know where the wood shelves are from. This link is to target but they aren’t the same. Do you know the color of the walls? It’s a Benjamin Moore paint in Barron Plain. I bought it at Vista paint store. I just put together the bayletto hudson crib and am debating about the hemnes dresser in white stain. I wanted to know if there is a BIG difference when you see it in the room put together between the difference in whites. Hi Jessica, Lauren has the white dresser from IKEA not the white stain. She says it’s not an exact match (the dresser is a little creamier than the crib) but with them on opposite sides of the room, she really doesn’t notice. I can tell you that I have the same dresser in white stain and it is more of a true white, but the finish is not glossy like the white. Hello- regarding the white vs white stain for the Ikea dresser- so does the truer white that you have seem to match better than the white stain in your opinion? Or are you saying the color is better but the finish is different? Oops I meant does the white stain match better than the white in your opinion. Hi Hannah, The white stain is a matte bright white finish whereas the white is a glossy creamy white. Lauren has stated that her white Hemnes dresser (not white stain) is not an exact match to the Hudson crib, but that it doesn’t bother her since they are across the room from one another. Also, the knobs are from Hobby Lobby. Hope that helps. Hi thanks for the reply, yes I understand the difference between the two whites. My question is which one seems to match better. I understand the white is creamier in comparison to the Babyletto, but wasn’t sure if the matte finish of the white stain was better or worse in terms of matching with the Babyletto compared to the white.